You have no competitors at all. Now, you’re confused, aren’t you? Today, I want you to think about your mindset, the way you think about your competition. You don’t actually have any competitors. You have customers and you have your products and services and that’s it. That’s all you need to think about. You don’t need to worry about anyone else. When you consider someone as a competitor, what you’ll find is that you’ll come up with excuses for why this isn’t working, for why we haven’t got any new customers, for why our prices aren’t making any money, etc. You’ll say to yourself “I am not making any money because that new shop that opened up down the street”. You’ll come up with excuse after excuse or as Tony Robbins says ‘your story’ and it’s all in the mind. Let me give you an example using Richard Branson. Now, a lot of people know Richard Branson because he started an airline– Virgin Atlantic. There were lots of airlines flying across the skies, but did he care? Did he regard them as competitors? No. He found his place in that market and he drove it deep. He nailed it. And now, he’s everywhere. He’s done quite well. So, let’s make it a bit personal shall we? Let’s say in your town ,there were three discount pharmacies (like in the UK, we have Superdrug and Saver, in Canada, there’s London Drugs and Shoppers Mart etc). Now — if those three businesses were on the street where you have your business, do you think, “Oh, I can’t do that. There’s too much competition”, or do you think, “Gosh, this town can sustain three of those, there’s a lot of demand and they don’t do it very well. I can do that better. I know how to get customers”? It’s all in the mind. A lot of this is in your noggin. You just have to get your mindset right. Don’t worry about anyone else. Don’t worry about anyone else’s prices. Just focus on you and your business for the time being. We’ve said before, only one company can ever have the cheapest prices at any one time, everyone else has customers, how does that work? So, concentrate on other things. Concentrate on your customers, your potential customers, and on your unique selling proposition. What is it that is special about you? Why should they come to you? Don’t worry about anyone else. Do it well and they will come. Now, today, I’m going to give you a great book to read this week. This one is one that literally changed the direction of my business. I’ve mentioned in the past that I won’t be where I was today without the E-Myth Revisited by Michael Gerber. That is fabulous. This one is another similar masterpiece in my opinion. 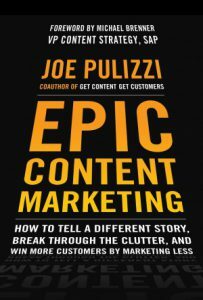 It’s called Epic Content Marketing and it is by Joe Pulizzi. 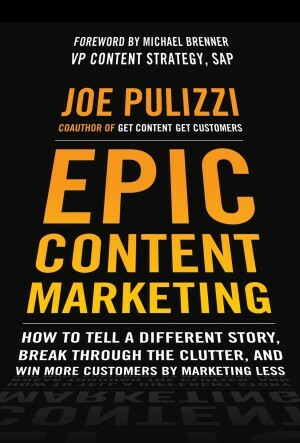 Joe started the Content Marketing Institute and is one of the forefront leaders of the content marketing revolution. He generally talks in terms of a lot of other larger companies, how they’re using it. He explains the whole concept of what content marketing is. He explains how it has been around for longer than we think. He explains how it works and how companies from John Deere, the agricultural company to Coca-Cola embraced content marketing. It’s great. Then, he explains a whole process of how to do it and that’s important. A lot of books just explain theory, but he explains how to do it. I bought copies of this for all my marketing team. We changed the entire style of what we did. We just put the brakes on, started again and it has taken us to another level. I promise you. Epic Content Marketing will make you think. Read it. Let me know what you think. I’m sure you’ll enjoy it. How is your mindset when it comes to competition?